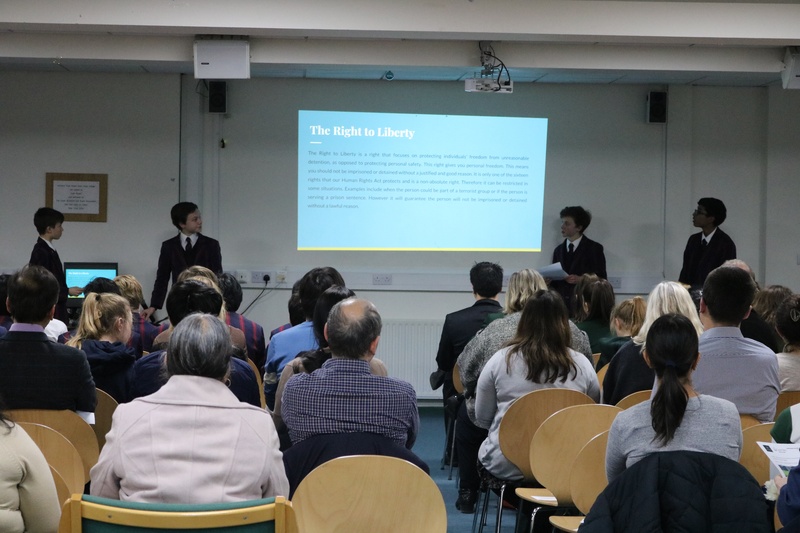 On the evening of Monday 22 January 16 Year 9 boys travelled to Surbiton High School to conclude a project that they had been working on for 3 months with the British Institute of Human Rights. During a trip to Queen Mary University on 1st November, the 16 Boys were introduced to the topic of Human Rights and were able to ask questions about specific Human Rights and what they protect. The boys both asked and answered questions excellently during the workshop and showed a real interest in the subject that impressed the University lecturers. Following on from the workshop the boys conducted a research project in to an area of Human Rights that interested them. In groups of four, they decided upon a question and worked together to produce a 3-4,000 word report in answer to their inquiry. 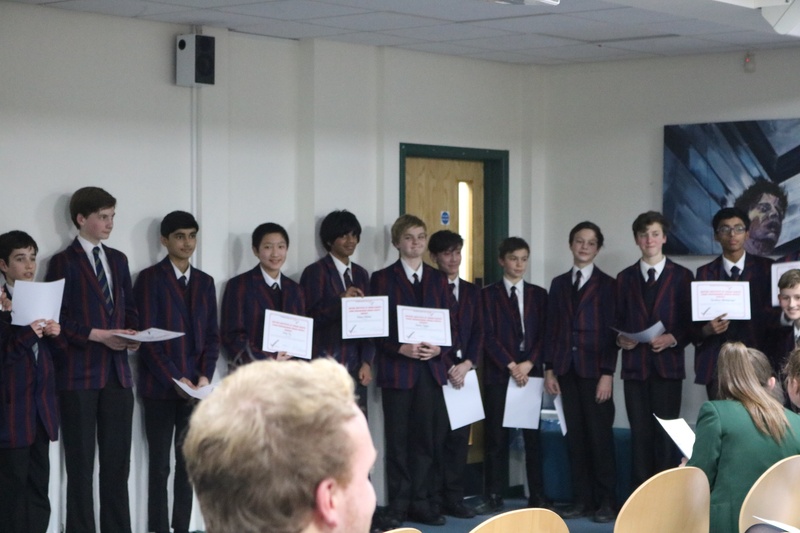 These were submitted in December, before the boys embarked upon producing a presentation for the evening in January. The presentation evening itself was a celebration of all the boys’ hard work that went in to the projects, and a chance for the groups to explain what they found interesting in their research and to give parents and teachers in the audience an understanding of their projects. The boys were simply brilliant and were able to discuss very sensitive Human Rights matters with excellent maturity. Each group should be very proud of their achievements and dedication to completing the project in their own time. The groups and their topics are outlined here; well done to all involved. Jack Yu, Roman Nicholas, Austin Taylor, Jotaro Takanohashi – Refugees in the UK, are we doing enough? Bulcsu Diossi, Ameer Morshed, Zameer Shahpurwala, Will Tillotson – Should Workers in the United Kingdom have more rights? 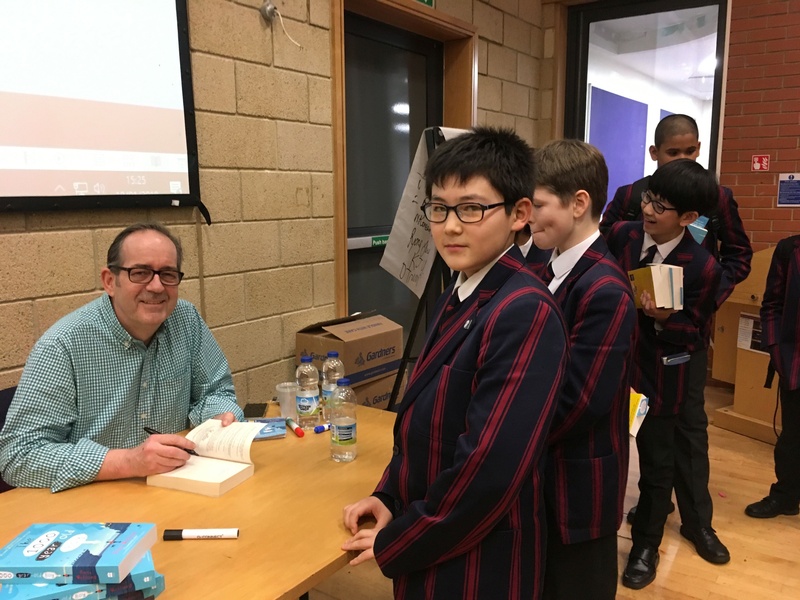 On Thursday 18 January, Year 7 was paid a special visit by best-selling author Ross Welford, who has written, ‘Time Travelling with a Hamster‘, ‘What Not To Do If You Turn Invisible‘ and ‘The 1000-Year-Old Boy’. He spoke to Year 7 with much humour as he described his latest book (The 1000-Year-Old Boy). He even gave us an exclusive look inside what he is planning for his next exciting book! We were given a tutorial on how to write a story and we even made up our own as a year group. At the end, he signed books that students had bought. The House Singing on Wednesday 31 January was a triumph of teamwork and musical performance, demonstrating the breadth, depth and importance of singing in the school. The evening began with the ATB Solo Song category, won by Vith Ketheeswaranathan (DW) with a subtle and beautifully characterised rendition of Butterworth’s Is my Team Ploughing? Euan O’Connor (DW) scooped second place, and made singing in French look easy, and Duncan Tarboton (R) came in third, holding the audience captive throughout his performance of Howells’ King David. Ben Gibson (TN) turned out a really lovely performance of Vaughan Williams’ Silent Noon, while Rory McKeon’s (KM) Widmung was both beautiful and appropriately giddy. Nnaemeka Anyamele (TN) closed the category with a wonderfully characterful movement from Handel’s Judas Maccabeus, which demonstrated a real understanding of the music he was singing. Turing-Nightingale took the trophy for the Part Song category, with a cheeky and light-hearted performance of Perry Como’s Magic Moments, closely followed by Kingsley-Montgomery, for whom Rory McKeon had arranged Amy Winehouse’s Our Day Will Come. Raleigh took third place with a resonant rendition of Fields of Gold. The Treble Solo Song category was won by Daniel Blaze (KM), with an extremely moving performance of Howells’ King David. Henry Studholme (L) came second, having confidently sung a lilting tune by John Jeffrys, and Milo Morrod (CG) delivered a sensitive performance of Henry Purcell’s Here the Deities, coming in third place. Unison Song was the most fiercely contested category, with the tone set by Churchill-Gordon who strode onto the stage in their shirtsleeves and performed a spirited version (with actions) of Forget You by Cee Lo Green. Darwin Wilberforce took the opposite visual approach, standing in neat rows in pristine uniform, but their singing of Noel Gallagher’s Don’t Look Back In Anger was no less spirited, and gained them second place. The winners were Drake, confidently led by Nathan Langford through a precise and beautifully sung classic, Those Magnificent Men in their Flying Machines, in which every word was audible (no mean feat in the sports hall!) Kingsley Montgomery came third, singing Rather Be by Clean Bandit, with great dynamic variation and excellent resonance. The evening ended with Turing-Nightingale performing a hugely entertaining version of I’ll Make a Man Out of You from Disney’s Mulan. Congratulations to all participants for a fantastic evening of performances, and special thanks to the leaders of the Unison and Part Song groups, and everyone who accompanied their house on the piano or drums. Rory McKeon deserves special mention for his conducting, which was judged not only the most spirited (despite being entirely the wrong way round), but also the most mimicable, and won him the coveted Baton award.